The 10 Best Delis in Iowa! Nothing quite beats that first bite into a deli sandwich. The aroma of the bread, the first tingling of your taste buds as the fresh ingredients meet your palate and that sense of satisfaction that’s soon to come! If you happen to be in the state of Iowa, there is no shortage of spots to have this deli experience. All across the state, you’ll find delicious local deli spots serving up freshly-baked breads, meats and cheeses that will satisfy your cravings. Here are the 10 best delis in the state! A welcomed lunch and dinner located near the University of Iowa, Mama’s Deli on Washington Street serves up that home cooking that you need to study for finals or enjoy the afternoon. Featuring sandwiches, salads, wraps and more, Mama’s menu features staple classics like honey and cheddar ham sandwiches and an ever-rotating list of daily specials, making every trip to Mama’s a potential new taste experience for you to enjoy. PJ’s Deli in Newton has everything you expect and more from a local deli. 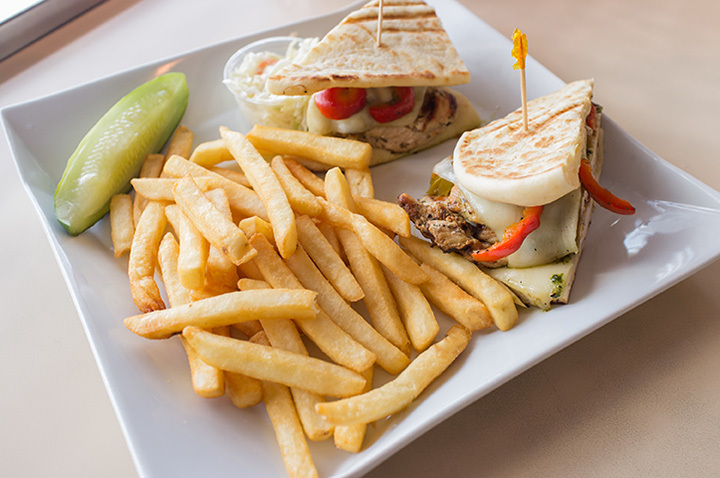 Featuring an extensive list of sandwich specials like the best-served-hot Li’l Italian (ham, salami and provolone on a hoagie), but with their rivaling open bar of deli options, perhaps your best bet at PJ’s is to build your own sandwich with all your favorite toppings to choose from. Whether you build your own or order from the menu, at PJ’s you’ll never leave unsatisfied with your deli experience. The Depot Deli and Restaurant in Shenandoah has a lot going for it to make it one of the best eating spots in Iowa. Not only is their menu stacked with specialty sandwiches, breakfast fare and weekly specials, but the restaurant itself is housed in a restored railroad depot, making for quite the unique and cozy dining environment. Once you’re done with your deli sandwich at the depot, just outside the door lies the Wabash Nature Trail waiting for you to explore, making the Depot Deli the perfect spot to refuel for your next adventurous day exploring Iowa. Located on Polk Boulevard in Des Moines, Maccabee’s Kosher Deli is touted as the only kosher deli in Des Moines, and regardless of your eating preferences or restrictions, it is one eatery in Iowa that everyone should visit. Featuring overstuffed specialty sandwiches, salads and sides, plus meat by the pound, Maccabee’s delivers when it comes to high-quality, made-to-order deli products and entrees. Call ahead to Maccabee’s, whether you’re dining in or out, and they’ll have your food ready for you when you arrive, that way you won’t waste any time in discovering what makes Maccabee’s one of the best delis in Iowa. The name says it all for The Classic Deli and Ice Cream Shoppe in Brooklyn, and while the ambiance and decorum live up to its classic design, the unique menu items shine on a time that is more modern. Featuring fares like salmon patties with mashed potatoes and ham and bean soup with a side of cornbread, you can expect much more than just the standard classics at The Classic Deli and Ice Cream Shoppe, and to really top of your experience, be sure to utilize the second half of their name and treat yourself to a shake, malt or ice cream cone while you’re there. Featuring a long list of build-your-own basic and specialty sandwiches, the West Street Deli in Ames is the quintessential college campus deli spot open to all community members alike. While the cold-cut creations are all worthy of your attention, it’s worth mentioning the many side items also offered by West Street Deli, including made-from-scratch soups, coleslaw and mac & cheese. Whatever you order though, and whatever you order to go along with it, know that your taste buds will be treated right at West Street Deli. It’s no mystery to find The Corner Deli in Clinton, it’s on the corner, the corner of 5th Avenue and 3rd Street to be exact. While it’s worth your time to visit The Corner Deli for any number of their unique specialty items or build-your-own sandwich offerings, if you really want to enjoy The Corner Deli correctly, they also offer a signature and classic cold buffet options that can give you a little taste of everything. Don’t see anything you like on the menu at The Corner Deli? While that’s highly improbable, the sandwich makers behind the counter are happy to custom make any and all specialty recipes you can dream up. Providing a Chicago-inspired taste experience to the streets of Mason City, State Street Deli prides themselves on their selection of in-house sandwiches and to-go deli options featured in the store. Whether you go for a State Street creation like the #3 La Salle St. (roast beef, swiss cheese, fire-roasted vegetables on a French roll), or you go for something more traditional like a signature Reuben sandwich, even if you just stop in to grab some deli meat to go, within your first visit to State Street Deli, you can be sure it won’t be your last. Featuring the finest ingredients grown in the surrounding Iowa communities, Greyhound Deli of Cedar Rapids is perhaps the top in the market when it comes to made-from-scratch sandwiches, soups and salads. The evidence is found through the aroma as soon as you walk through the doors of the Greyhound Deli, and within every bite of their signature and traditional entree meals, you’ll experience to yourself the joy and taste of locally grown ingredients. Hagar’s Manhattan Deli has been providing an authentic Big Apple taste to Des Moines since 1982, and with their extensive menu options like hoagies, hot Italian sandwiches and constantly rotating daily specials, it looks like they are here to stay. Located on Ingersoll Avenue, Hagar’s adds even more variety to this already bustling street of Des Moines flavors and culture, and it’s well worth the trip inside to experience for yourself all the sights, smells and tastes that make Hagar’s Manhattan Deli an Iowa classic.